term myself a visionary painter for lack of a better word. I can close my eyes in a dark room and if there is no outside noise or attraction, plus, if there is no conscious effort on my partthen I can see color, lines, patterns, and forms that make up my canvases. I have always copied these arrangements exactly without elaboration." Throughout his life as an artist, Forrest Bess strove to invest a personal symbology with meaning, developing a complex visual vocabulary to accompany his obsessive devotion to beliefs and theories that alienated him from the mainstream. Bess's small paintings are filled with elemental and highly personal images. To Bess, his visions and the resulting paintings came to represent a pictorial language that he believed had universal significance. Along with medical and psychological theories based on his own unguided scholarship, he believed his imagery formed a blueprint for an ideal human state, with the potential to relieve mankind of suffering and death. 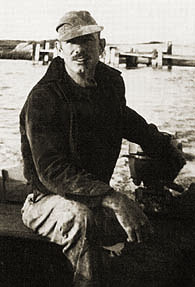 Born October 5, 1911, in Bay City, Texas, Bess lived his life there in virtual isolation, on a strip of land accessible only by boat. "I try to tell myself that only by breaking completely away from society can I arrive at a reasonable existence." A semi-migrant childhood was followed by some years at college, where he began by studying architecture but found himself diverted into studies of religion, psychology, and anthropology, readings that would later inform his own radical theories. 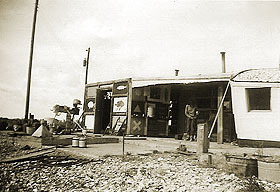 Dropping out of university in 1932, Bess worked for several years roughnecking in the Beaumont oil fields, and also made several trips to Mexico. It was during this time he began to exhibit his paintings, earning one-person shows at museums in San Antonio and Houston. During the war he enlisted in the Army Corps of Engineers and was given the task of designing camouflage, until he suffered a psychological breakdown and left the service. After living for a while in San Antonio, he finally settled at his family's camp at Chinquapin, near Bay City. 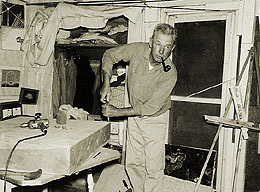 Bess was never comfortable for very long around other people, although he hosted frequent visitors to his home and studio at Chinquapin: artists, reporters, and some patrons made the trip to the spit of land on which Bess's shack stood. He did forge lasting relationships with a few friends and neighbors, and maintained years-long friendships and correspondence with Meyer Schapiro and with Betty Parsons, his art dealer in New York. But ultimately Bess prefered solitude, and his prolific activities as an artist, highlighted by limited notoriety and success, alternated with longs spells of loneliness, depression, and an ever-increasing obsession with his own anatomical manifesto. He was never able to win any converts to his theories or validation from the many doctors and psychologists with whom he corresponded. In his own home town of Bay City, he was considered something of a small-town eccentric. Forrest Bess died in a Bay City nursing home in 1977 from skin cancer. In the years following his death, his reputation as an artist began to build, and he is now regarded as a unique phenomenon, an artist who cannot be grouped with any one school but who answered solely and completely to his own vivid, personal vision. Michael Ennis, "His Name Was Forrest Bess," Texas Monthly, June 1982. John Yau, "Forrest Bess," exhibition catalog, Hirschel & Adler Modern, New York, 1988.